Take the now infamous Stefan Eriksson Ferrari Enzo Crash, an Enzo model kit and a lot of free time and you get this lovingly detailed, expertly recreated and irrepressibly awesome diorama. That it came from Jalopnik reader/commenter HansStuckJr just makes it that much cooler. Photos of the original crash and photos of the recreation below, as well as the full details about this masterpiece below the jump. More on the Enzo Incident on PCH, With Photos! 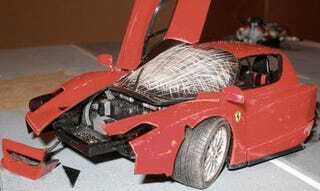 I used the Tamiya Enzo kit, along with the Scale Motorsports detail set (carbon fiber decals, photoetched parts). The wheels are from a Tamiya Opel Calibra DTM kit, the airbags are medical tape and the firewall insulation is foil from a cigarette pack. I displayed the model at the 2007 NNL East in Parsippany, NJ. "NNL" stands for "Nameless National Luminaries" and references an editorial written in a model car magazine about 25 years ago. The editorial lamented the fact that many talented model builders were discouraged from bringing their work to shows because of the political nature of the judging process. It inspired a group of like-minded folks to create a show format where the only prizes are determined by a people's choice vote; in other words, everyone that attends gets to vote. It has since become the most popular show format by far. I think there are 4 or 5 NNL shows across the country, and NNL is one of (if not the) biggest. Damn, that sounded like a press release! Check out their website, it has links to galleries from previous years. Some of the stuff is mind-blowing. SUPER DETAIL POTENTIAL!!!! By the way, this was all an answer to a QOTD about favorite model cars. I'm hoping the rest of you mugs can come up with something as awesome for future QOTD's. What&apos;s The Best Model Car You&apos;ve Ever Built?